The local wine shop had been in the same location for 35 years & had been run by the same family for 30 years. They had been part of the community since buying the business & had always supported the local school, charities & junior sporting events. Customers would come in for the great advice & friendly service. However, as time & progress moved forward, business began to dwindle, a big factor was the massive chain store supermarket that opened in the next suburb. The new store has a discount liquor chain attached to it & has heaps of exposure to passing customers as well as catching all the people visiting the supermarket. The sheer volume of the chain means they can offer great pricing on most of their stock, but the selection is a bit limited & the staff are nowhere near as knowledgeable as at the wine shop. The wine shop owners knew that something needed to be done, so as part of their new marketing push they called a number of marketing & promotion companies to find out what was available & how they could get back some of their lost customers. Together with the marketing company the wine shop owners formulated a multi-staged plan to get customers coming back & to keep them coming back. After a few weeks of ideas & concepts the campaign was called “It’s Our Shout”. This campaign centred around the wine shop being the experts & that although they had all the technical knowledge about what “should” be good; customers needed to come & try for themselves simply because every taste is different. The campaign basically centred around tasting before buying & had 3 main objectives – getting new customers, keeping existing ones & getting them to come back. The owners selected 3 main tools to accomplish each objective. 1) invitation to existing (database) customers & also advertising in the local newspaper. As soon as the campaign started, customers began to come back to the shop. Most customers were returning, but there was a good slice of new customers also. The owners were very pleased with the initial result, but the best result from the campaign was totally un-measurable; word-of-mouth. The biggest upside of the whole campaign was the fact that customers were talking about the shop again & with that revived exposure, business began to grow. 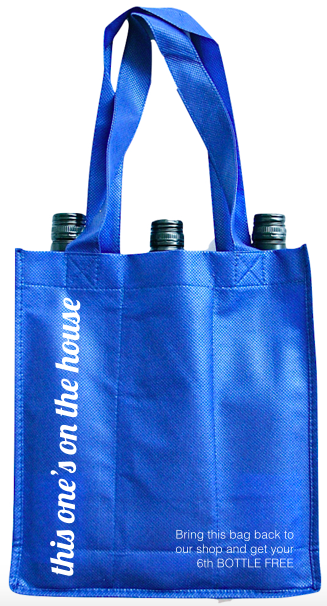 The owners selected a 6 bottle wine bag as their selected give-away to customer retention. As the name suggests, this is a Bag People bag made specifically to carry 6 bottles of wine. This wine bag tied in to the “Its Our Shout” campaign by custom printing ‘this one’s on the house’ on one of the bottle compartments. As an added incentive to get people coming back to buy their wine, the shop would offer a free bottle of wine for people who came back with their bag & bought 5 full priced bottle – of course their was fine print with this offer “our shout is your choice of any bottle valued up to the retail price of your cheapest bottle you’re buying”. The wine shop ordered 2,000 x 6 bottle wine bags from Bag People & gave them all out in 10 weeks & they’re still coming back.